Today is Pi Day. You know, "pi" as in the Greek number π = 3.141592(etc), the ratio of a circle's circumference to its diameter. Celebrated in certain circles (haha) on March 14th, as in "3.14"
Next year, will be even MORE exciting, because it will be 3.14.15. Just imagine how excited everyone was in 1592. For the past few years, my daughter MM has been a prime celebrator of Pi Day. She likes math, making her an anomaly in our family. She also likes pie, which makes her fit back in. And hello, what is the best way to celebrate Pi Day? With circular pies, of course! Every year on 3.14, MM would waltz into her Montessori elementary school with six or seven pies to share. 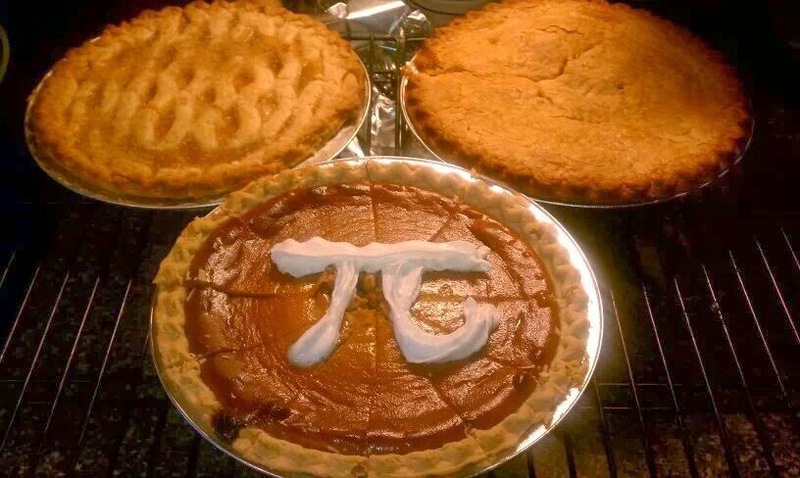 They would talk about pi, have lessons on circles, divide the pies up into even sections, and equate math with joy. Which meant every year on 3.13, I would be in the kitchen making pies. Or should I say BAKING pies. I love pie but unlike Keri Russell's character in the fabulous movie Waitress, I am not so adept with crust. Or filling. My pies are not lovely. Lucky for me, Mrs. Smith makes lovely delicious pies. There was always a variety - apple, chocolate, coconut, cherry, and MM's favorite, pumpkin - each one marked on top with a whipped cream π. And an extra one for the family. You know, just in case one got dropped. Or cut in the middle of the night. Now MM is in middle school. Things are more complicated with A/B schedules, class changes, multiple teachers, etc. Last night I reminded her that today was Pi Day. "Yeah....I'm good," she said, returning to finish her latest novel. "What does that mean?" I asked. "No pies on Pi day this year?" She thought (or at least she scrunched up her face trying to make me think she was in thought). "No, one of the teachers is doing that already. I'm good." I was a little relieved. Especially since it was 9:00 at night and we were at a soccer game 30 minutes away from home. I didn't relish baking pies until midnight. I was also a little disappointed. MM always got so excited about baking the pies, taking the pies to school, sharing the pies with her class and her teacher. Now she was a big Middle Schooler, too cool for pie. I miss my little Pi-ed Pi-per, my little purveyor of math and sweets, my little homeroom baker. She's growing up, but thankfully she's still a generous soul. Just because she doesn't want to take umpteen pies to school is no reason to despair. So what's for dinner tonight? A big ol' pizza pie, my girl's favorite, decorated with peppers in the shape of a π.